In early 2007 I came across a contest that was about to expire. 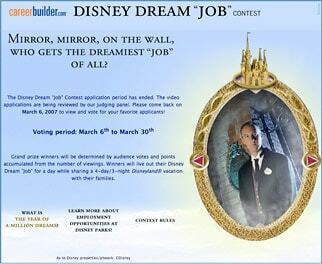 It would involve 25 crazy Disney fans being given the opportunity to live out their dream at Disneyland. 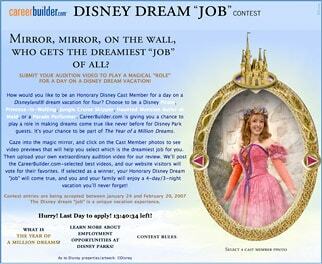 It was called the Careerbuilder Disney Dream Job. 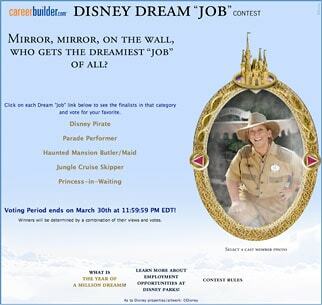 It would allow 5 winners from the following categories: Princess, Haunted Mansion Butler, Jungle Cruise Skipper, Parade Performer and of course Pirate, ARRR! I was most intrigued by the pirate role because I played a pirate in our children’s ministry at church. 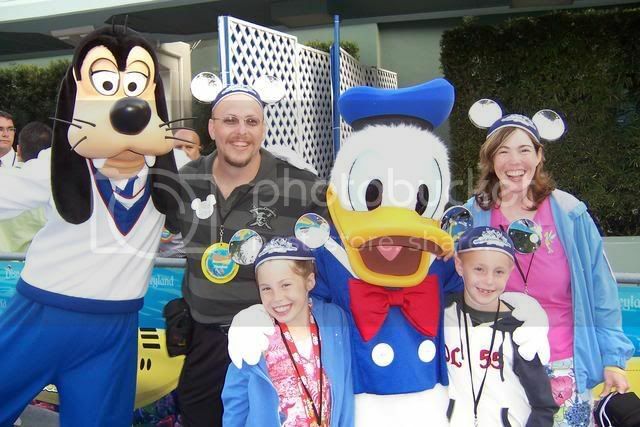 It also included a total of 4 days and 3 nights at the Disneyland resort, where we had never visited. The contest was broken into 6 phases. Beginning January 25, 2007 they listed the contest for public auditions. The video had to be at the most 45 seconds and some people entered more than one category. Here’s my audition video that I uploaded on February 19, 2007. I actually filmed it in our children’s room at our little church. I’m often asked why I list my pirate name with no spaces KennythePirate. Well, when I finally had my video completed and ready to upload, I was out of creativity. So, I just created a youtube account with no spaces and it stuck. Besides, you can’t abbreviate Kenny the Pirate as KtP :) It would be K t P. My little video had over 40,000 views! On February 28, 2007 the auditions closed In early March I learned that I was one of the top 20 finalists. Wahoo! Viewer voting was March 6-30. This phase was really convoluted because we were Disney’s first experiment into social marketing. 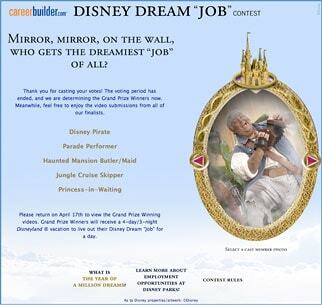 The rules stated that 80% of a person’s score was based on Youtube views and 20% was based on Disney’s scoring of each video. When the contest actually went live, they were making people “vote” using a captcha code. Everyone was confused if we were being scored on views or votes or both? There was never a clear indication. Some of us held voting parties, sent mass emails, used our Myspace or Facebook to promote ourselves. I created a few crazy banners that people could click on. Wait. We had to wait for a few days to learn who the winners would actually be. Once I was notified via phone call, I had to complete some legal paper work and get actual measurements for my costuming later. After everyone returned their paperwork, the winners were publicly announced. There were 5 winners from each category. 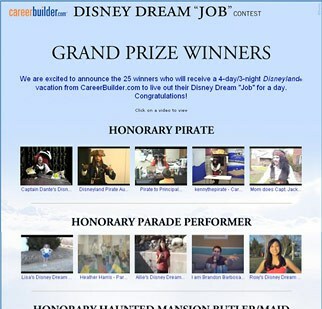 We all communicated on youtube and some little message board to try to guess what the Dream Job would actually be. Many of us became friends through this exchange and it was later moved to Ricky Brigante’s web forum. Ricky was a winner for Haunted Mansion Butler. Live the dream! I didn’t receive my actual rehearsal and perfomance schedule until the day before we were to leave. I really didn’t know what we were doing or how much time we would invest, so I booked 2 extra days before at Paradise Pier for my family and I to spend in the parks. It was a wise decision because the “Day” became 2 1/2 days, which was fine with me. 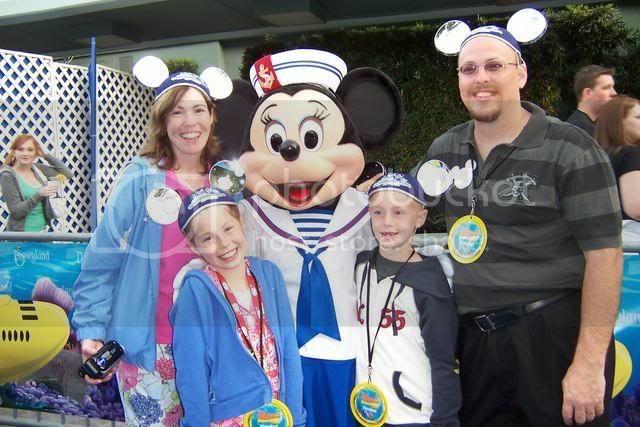 We were the earliest family to arrive at Disneyland. We left at 3 AM to make a 6:45 AM flight from DFW to LAX. We had to wait behind some lady who overpacked her luggage and took 20 minutes to fix it. We arrived at the gate just as they were beginning to board the plane. It was just over a 3 hour flight. We arrived at LAX and headed toward the luggage area. As we are almost arriving at the carousel, there was a gentleman standing with a Finding Nemo Event sign. I pointed and told my daughter that is the event we get to go to. The man overheard me or saw me pointing and said, Mr. White? We thought we were going to have to take the Disneyland Express shuttle bus. (They had messed up our tickets and we were looking for where we should go to get it straightened out.) He grabbed all of our luggage for us and escorted us to the curb to await our private car. He was super nice with the kids. 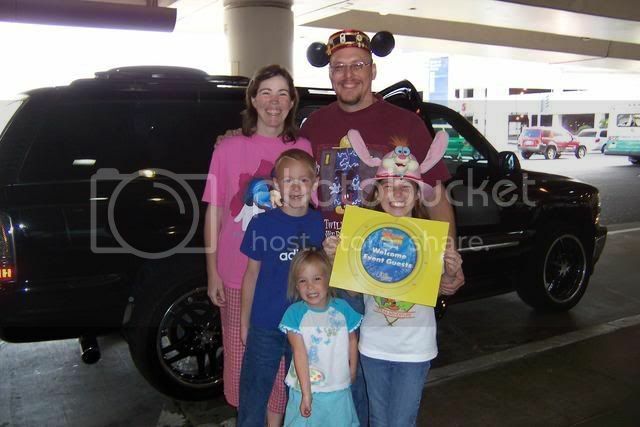 We loaded the black chauffeured Tahoe and headed for Paradise Pier for 2 days. The driver thought we were staying at Disneyland Hotel throughout and took us to the wrong place. Upon arriving at Paradise Pier Hotel, we dropped off our luggage and went in to purchase some autograph books for the kids. They love to get character autographs. (More on that later). As we were walking out, one of the CMs commented on our unusual hats and we explained that we made them ourselves and he asked us to wait just a minute. He returned with 3 of the Tinkerbell pin sets, one for each child. We headed off to California Adventure. We had never been to DL or DCA so we were super excited. We rode Soarin and ToT right off and then toured around. The kids got Mr. and Mrs. Incredibles autographs as they only stamped at WDW. 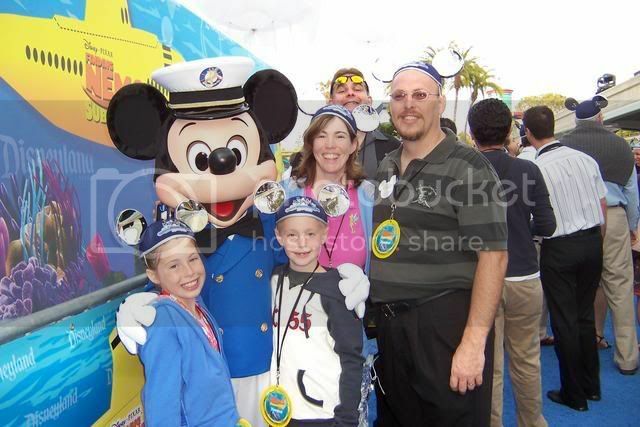 We stopped for a photo with California Mickey. We had a 5:40 dinner at Ariels Grotto. The princesses (Ariel, Belle, Snow White, Cinderella & Aurora) were super great with the kids and spent a lot of time with them. We had to request that Aurora come back as she was about to leave and we had missed her. She accommodated us very kindly. My two girls have a tradition of having the princesses to sign a hat, so they did that here. I must say though, that when it comes to the food, it was just plain bad. Ive had better fish from a Gortons box. They closed at 7 PM for grad night. We wrapped our day with a fling on POTC and HM and Splash at DL. They closed at 9 PM for grad night. We headed back to grab a swim at the pool and shopped a little along the way expecting the pool to be open until midnight at least. We checked in and received our room keys and went to crash. We had to call down to have our luggage delivered. We were told there was a message, so we returned to the desk to receive a package. I thought it was dream job related. It was 3 Minnie Birthday balloons for my daughter. We wanted to go swimming, but they closed the pool at 10 PM!!! Off to sleep we go. 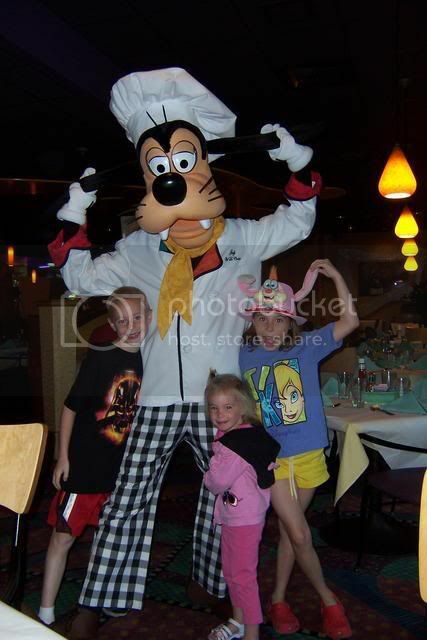 We had a 7:00 AM breakfast at Goofys Kitchen. Ill highly recommend this in every way. The server was great, there were a bunch of characters who spent quality time with the kids and a huge selection of brunch foods. I stuffed myself full for the day. I liked the little play times they had with the children too. Chip was especially funny and even wrote messages on the table about how hyper-excited my little one was. Chip and Dale are her favs. 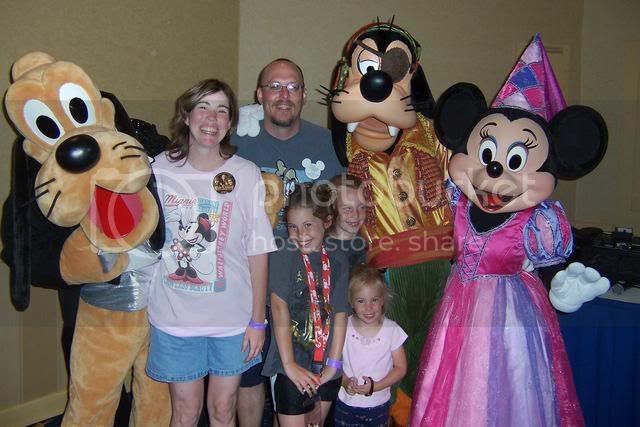 We met Peter Pan, Chip and Dale, Baloo, Goofy and Pluto. We got to DL just as they were opening the gates for the morning. 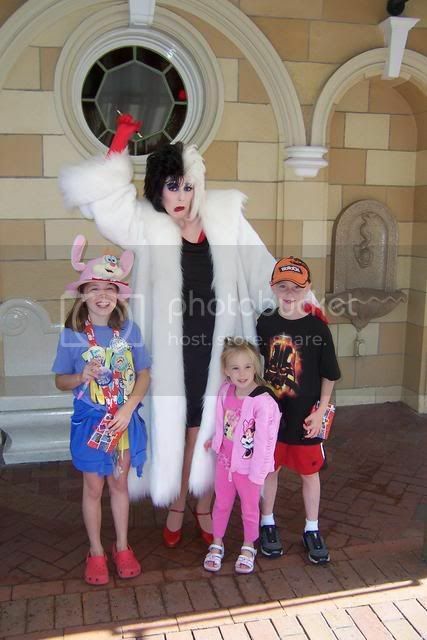 We stopped for a quick picture with Cruella as the kids didnt have her autograph yet. As we made it to the end of Main St., Ed the security guard stopped us because he saw my daughters Bday pin. He told us the subs are doing a soft opening and we should make a bee line there. We did and waited for about 30 minutes. It was a great ride. I liked it much better during the day than at night. We had originally planned to do Toontown Madness, but with the subs open we wanted to make sure our little one would get to ride it. My oldest daughter thought that meant we wouldnt get to go to Toontown Madness at all now. After a few tears, I explained that we would go tomorrow. We did your basic tourist stuff, mostly in Tomorrowland. Because it would be closed the next day. 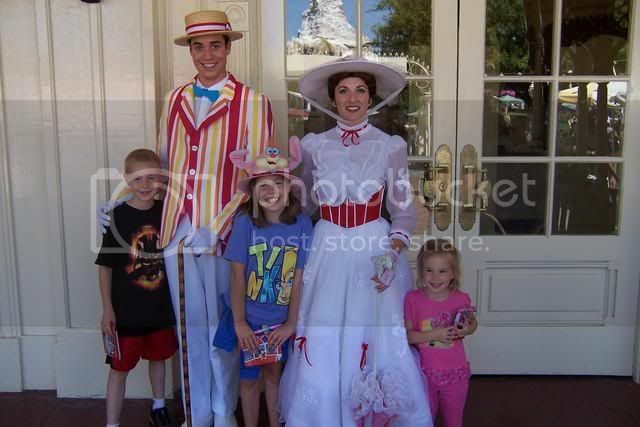 The kids played with Mary Poppins, Peter Pan, Wendy, Mad Hatter & Alice at the Plaza area. 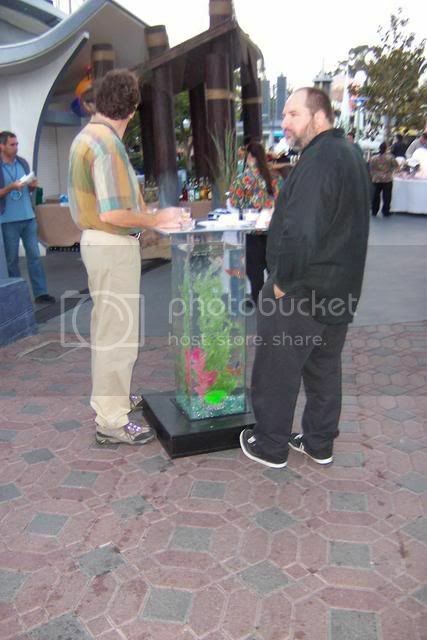 Then Bert came too and they got his autograph for the first time. My son and some little girl won and got the right to put up the chairs from their musical chairs game. We finally met up with my friend Tim at the 3:30 Dreams Parade. While I was waiting I had a great conversation with Jason from the Indy ride about the Dream Job competition. At the end he gave me an attraction re-entry ticket which we used later in the day. My friend Tim and I exchanged some gifts. He gave me a limited edition compass from the Pirate event in 2003 and a cool ToT event T-shirt. I had made a butler hat with glow in the dark wings for him. The wing unfortunately bit the dust as it was a bit too fragile. Ill try again later to perfect it. We rode stuff until closing time. We checked out of the Paradise Pier and into the Disneyland Hotel for the remainder of the trip. My daughter was given an autographed photo of the Big 5 at the Castle for her Birthday. We took the first monorail to Tomorrowland for Early Entry day. 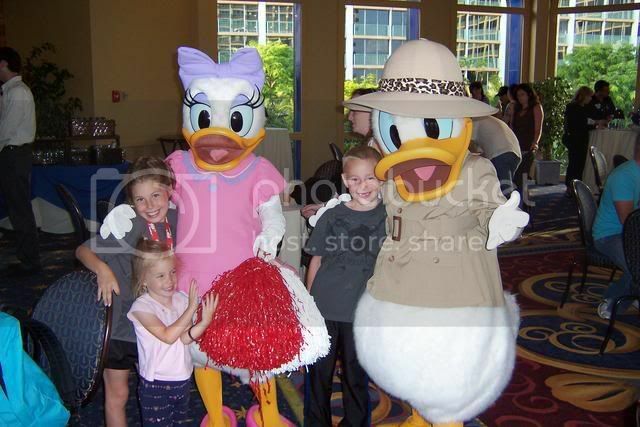 I was surprised at how tightly packed they were compared to WDW and there’s no air conditioning. 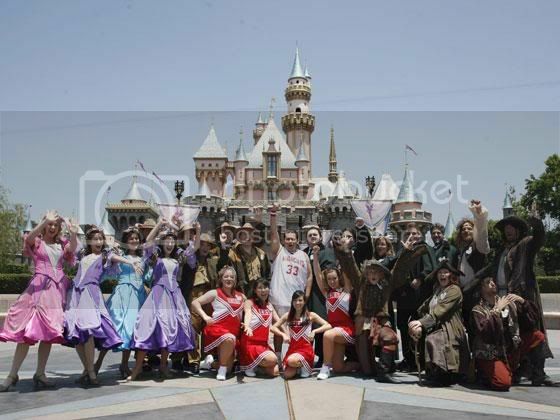 We rode Peter Pan, Mr. Toad and some others. We headed over to use our Toontown Madness coupons. We rode Roger Rabbit. It was a fun ride for the kids to spin the car around. I get sick on spinning rides, so I firmly grasped the spinner to reduce the spinning motion. We rode Gadgets Go Coaster and met Mickey at his house. I was disappointed that he didnt still have on his Mayor Button. We toured around a bit and headed for breakfast. We had a 10 AM breakfast at Plaza Inn. A great breakfast for characters also. The food was just okay. The kids didnt really care for the eggs here though. The way it was set up creates a log jam in the middle of the room and you have to wait in line for eggs and bacon and such. There favorite part here was meeting Rabbit from Pooh. Another autograph they didnt have. I went ahead and bought birthday baskets for each of my kids so no one would be left out. 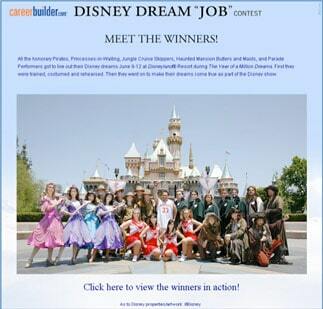 At 2 PM about 14 of the Dream Job Winners met up at ToT to have a group photo made. We all posed in crazy ways and many of us purchased the photo for the memory. We toured Adventureland, NOS, Critter Country and Frontierland today. I met several people from the web boards I post on often. It was fun meeting up with them randomly. 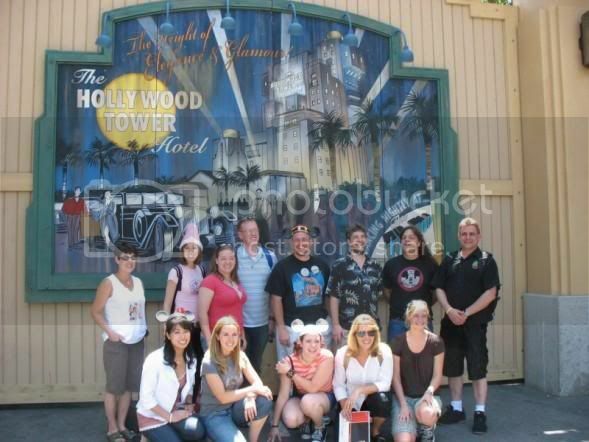 We headed back to the Disneyland Hotel to meet our tour guides only to be escorted back to Disneyland again. Did you know that tour guides actually walk faster than a cheetah can run? It was difficult to keep up with them throughout the trip. 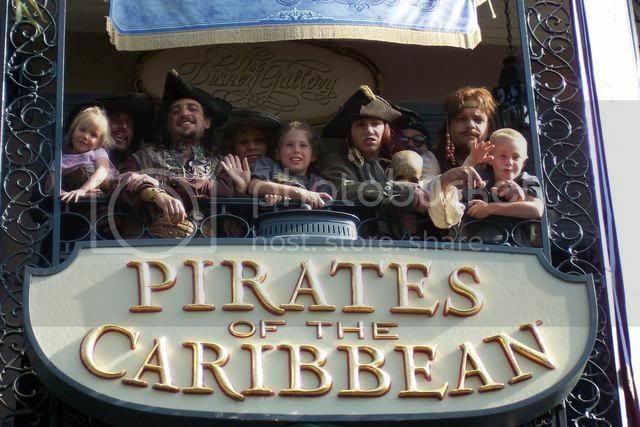 Milissa and Marc were the best though, we had such fun with them and Milissa is such a huge Pirates fan. She wanted so bad to put on the costume to no avail. We were taken to the top of the Plaza Inn restaurant to film our opening shots for the Careerbuilder video with the castle behind us. It was fun, but nerve racking trying to think of what to say in a brief time. At 6:45 we went to an invitation only dessert reception at Aladdins Oasis. 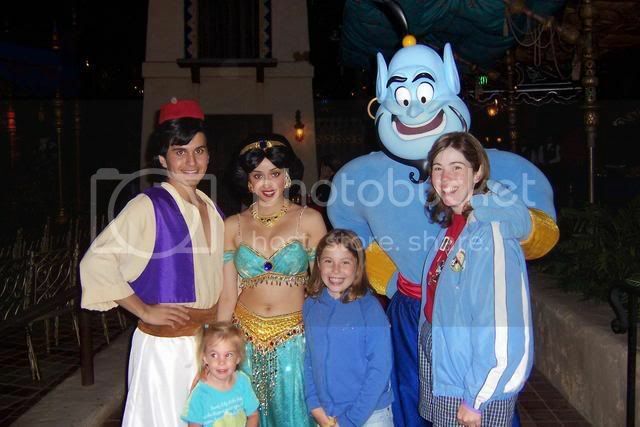 Aladdin, Jasmine and Genii were there to greet the guests. 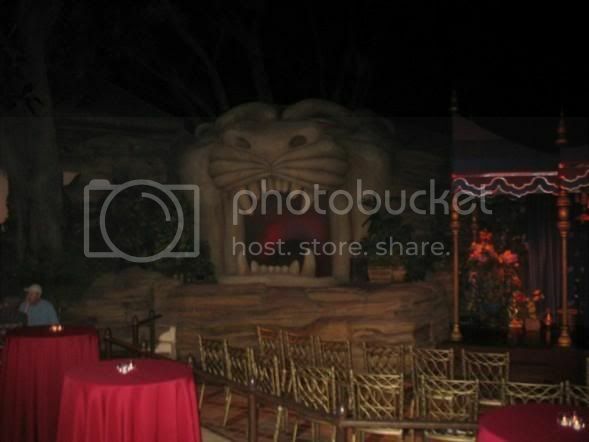 and we were escorted through the Lions mouth into the CAVE OF WONDERS to go backstage for the first time. I guess there were 25 Diamonds in the Rough. I remember there was this bright red light that blinded me and I almost tripped. We went through a tunnel and off to our orientation. More Disney people spoke about how great it was to have us and the importance of keeping the Disney magic alive. We were separated by groups. 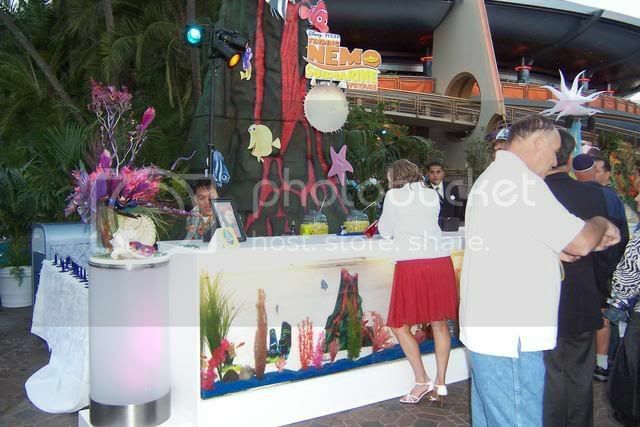 Each groups table was decorated to the theme of the attraction. I remember seeing a glass slipper and tiaras for the Princesses on the blur off entering the room. Our table was by far the coolest there. 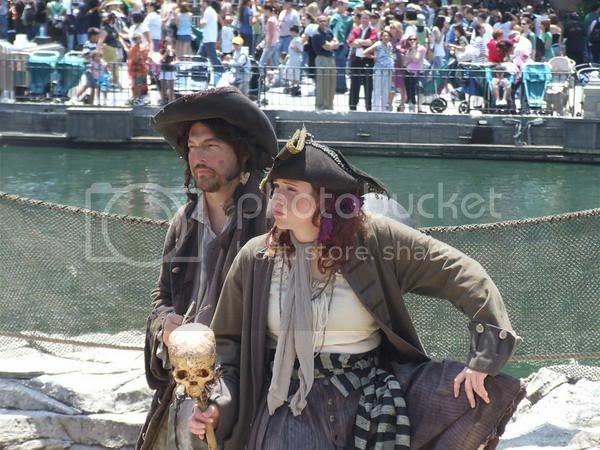 It was themed with all sorts of Pirates garb. Swords, dubloons, skulls and a parrot on top overlooking it all. We werent allowed to take cameras backstage, so were hoping Disney will send us a photo of the tables, they were incredible. 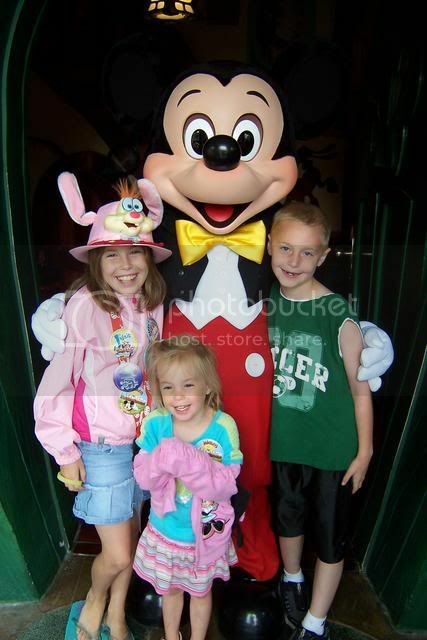 We never saw those photos :( There were Mickey ears with our names embroidered on them and an envelope attached. Inside was a $250 gift card that my wife spent while I Dream Jobbed. We met with our director Glenn who was just amazing, and his assistant and stage director Phil who was so kind. 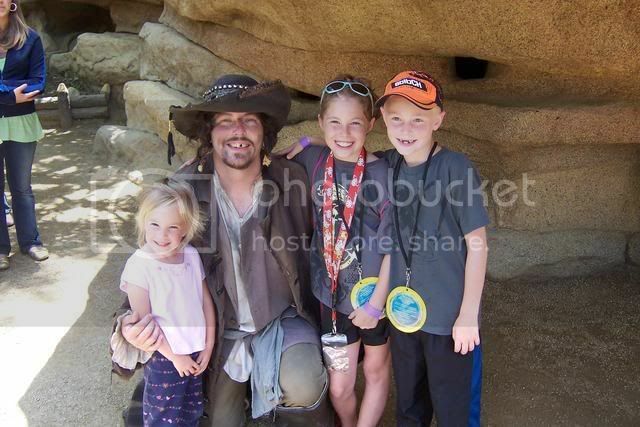 He explained the idea behind Pirates Lair. That there are cursed Pirates trapped on this Island who cannot die and that the only things they know about current culture are the things they learn on the Island. He told us of the importance of maintaining the story. The story is important and sets Disney apart in the theme park world. 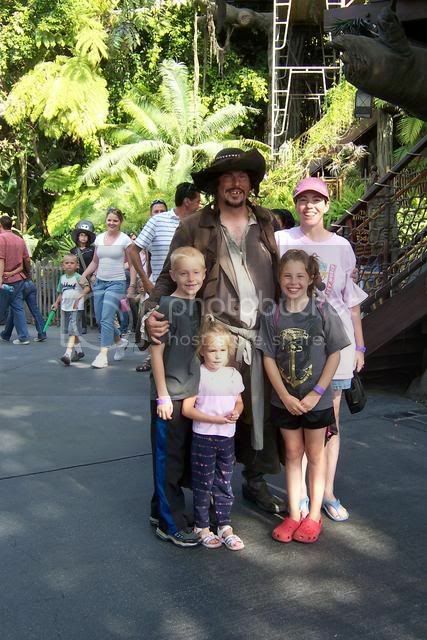 He had us introduce ourselves and tell why we wanted to be a Disney Pirate. They escorted us to the Plaza area for a special viewing area of Remember Dreams Come True Fireworks. Our family rejoined us, but they didn’t provide enough seating for the families. We got to chat with the Disney and Careerbuilder people who were very kind before the fireworks. It was the best fireworks show Ive ever seen. Some of us winners exchanged gifts with one another. I made up a little treasure chest with a key which I had retrieved from the dog and a pirate Disney Dollar inside. On the back I signed each one “Kenny t Pirate Ill work for less than a buck an hour.” Its from my video. We toured the park and ended the night with Indiana Jones, HM and POTC again. We had to arrive downstairs at 6:30 AM. It was work time, vacation’s over! Our guides took us by shuttle backstage. We got a quick continental breakfast and headed off to makeup. Being almost bald, they were debating making me a bald or hairy pirate. They decided on hairy. It was pretty strange to have someone applying makeup to my face and braiding my hair. The camera crews followed us around everywhere and asked us questions constantly. Some things they asked us to try to do and others we could freelance. After getting the makeup and black hair I requested that they use mascara on my goatee and eyebrows to make it look right. We went down the hall to costuming. They had some pre-chosen for us, but there were a couple of different choices of shirts and pants. The pants I liked the best didn’t fit. We then were assigned our hats and extras. 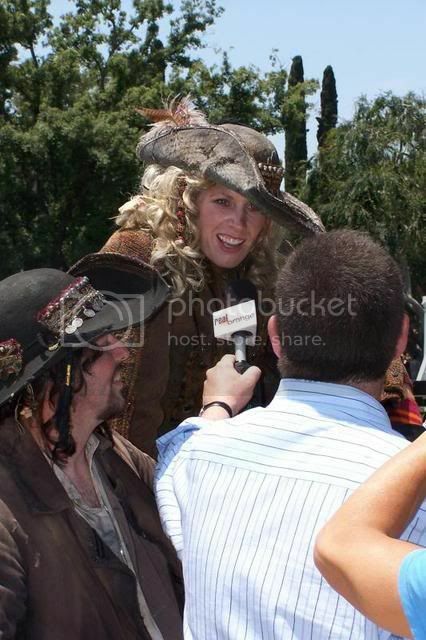 At this point Glenn informed us that we are wearing ACTUAL COSTUMES FROM THE POTC 3:At World’s End movie. My hat even had the guys name it in. His name was also Kenny, too strange! 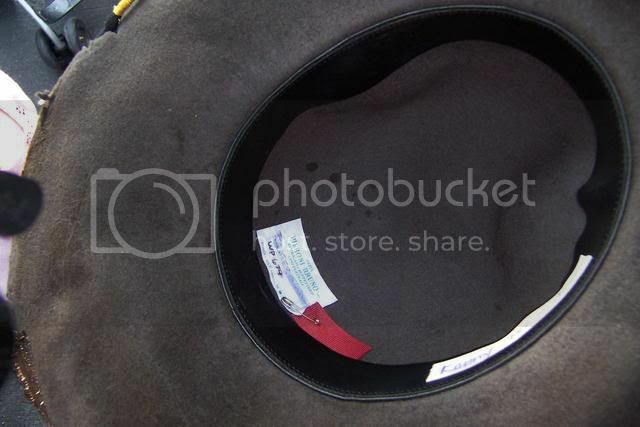 Look closely and you’ll see the POTC and Kenny’s name in the hat. We were then taken to Traditions class in costume. For CMs this usually lasts 8 hours and includes all sorts of paperwork and legal mumbo jumbo, but only about 1 hour for us. We were lined up by character type behind our ushers. Pirates had Pirate Goofy, Princesses had Princess Minnie, Paraders had Cheerleader Daisy, JC Skippers had Skipper Donald and HM Butlers and Maid had Butler Pluto. 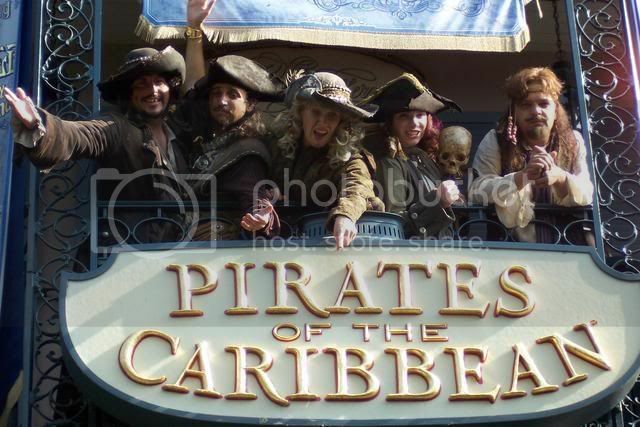 Pirates were allowed to sit on the front row. Garnett and Howell were great Traditions facilitators. 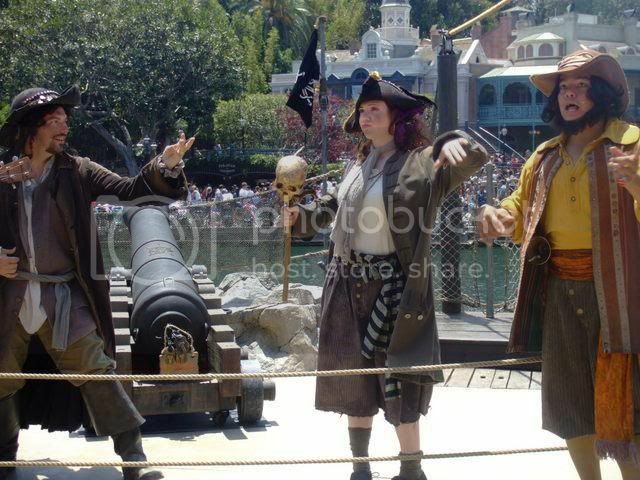 The Pirates decided to commandeer Disneyland, so this was our first effort. We interjected whenever we could, trying to have some fun while in character. We were asked questions about Disney and its vision statement. If we could get it right, we were given a little character toy. I ended up with 2. I remember clearly the parts about Teamwork and Disneys 4 keys: Safety, Courtesy, Show and Efficiency. I can explain more if you wish. At the conclusion of Traditions we were given our Honorary Cast Member name badges. They are shaped like a Mickey head with YOMD on them. After Traditions we were taken to the Castle to have some group photos made. After the photos the children were approaching us for photos and autographs. It was our first guest experience and we could see what a joy it is to be a Disney character. As we paraded backstage I stopped and gave one of my little toys I had won at Traditions to a cute little Asian girl. We went to the Eat Ticket backstage for a boxed lunch of sandwiches, chips, cookies and sodas. I enjoyed spending some time with winners in other categories during this lunch. After lunch we were off for 4 hours of rehearsals. The time just seemed to fly by. 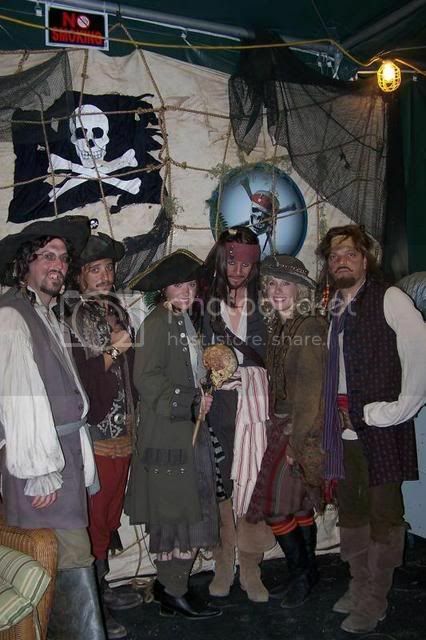 Glenn introduced us to Paul and Tim from the Pirates Lair show. They are an incredibly talented bunch. I expected that Disney would have a character already assigned to us with the curse and such. Instead we got to workshop it all. It was so much fun. Glenn started with me. He said he had never met a person who smiled so much, so my curse must include smiling. The banter started with names like Smilin Sam and such. I said, If it is a curse to smile, it should be the opposite of my name. After more bantering I decided on Bad Mood t Blackhearted. I thought it sounded the darkest of all mentioned. Each of us got to give input on the others character and back story and curse. I was cursed to smile because I killed a man that was just too happy and regardless of the circumstances I had to smile. We did some staging and blocking and practiced singing the choruses. We were out of costume and makeup and given a cast raft to the Island and taken to see the Bootstrappers with whom we would perform tomorrow and the stunt show. We did a quick discussion of how we are to set up and a tour of the Island before returning. 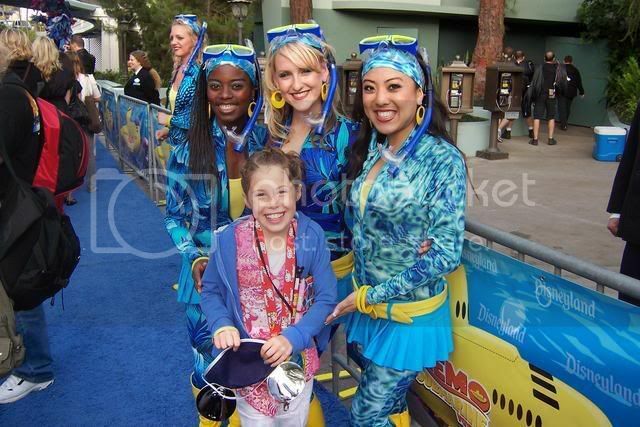 We were invited to attend the Nemo blue carpet press (not celebrity) event. and the big 5 characters in nautical themed attire. and a Bruce to photo op and a crush puppeteer as well. 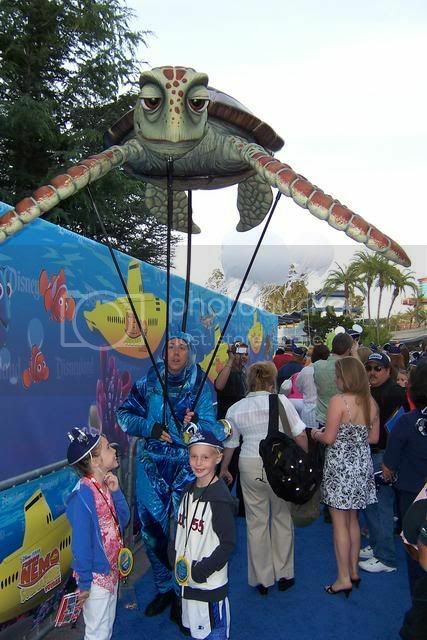 The decorations were fantastic and really made you feel like you were underwater. Half of Tomorrowland was blocked off so Autopia, Innoventions, Tomorrowland Terrace and HISTA were closed. 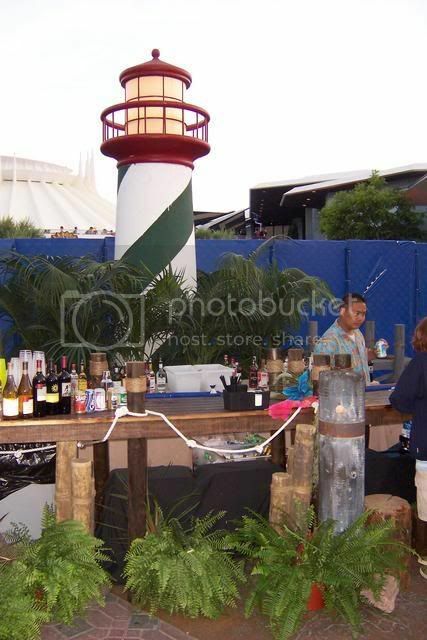 The terrace became a dance area that alternated between live band and DJ mix. My kids had fun dancing along to Follow the leader. There were all kinds of finger foods. I was disappointed to see fish balls and told the girl Fish are friends, not food. There were chicken and shrimp dishes. The desserts were amazing. I loved the little aquariums. 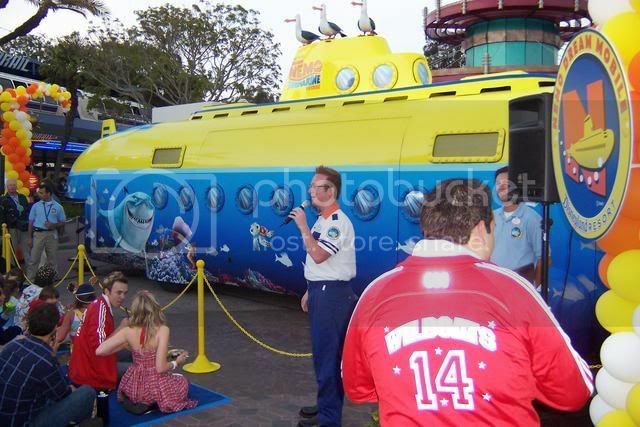 The Mobile Nemo Sub was there and did 3 Turtle Talk shows. 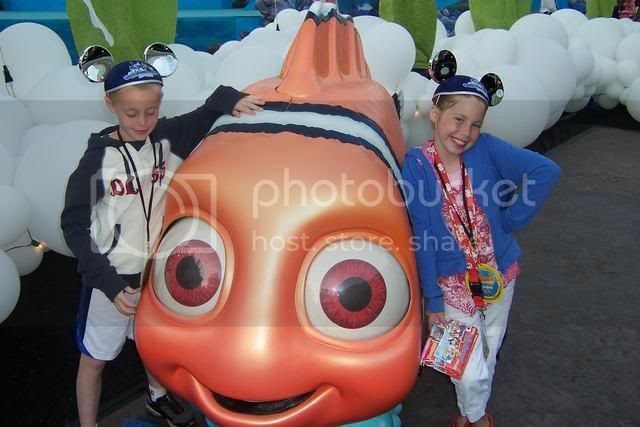 The Nemo Sub ride was open and we went on it again with little waiting time. They also had popcorn and frozen lemonade stands open for free. I saw Tony Baxter and spoke to him briefly. A very kind and accommodating gentleman. I spoke briefly to John Lasseter as well. While we were leaving the event we were each given a Finding Nemo Watch which has water inside the lens. We rode some more rides and went back to the hotel. 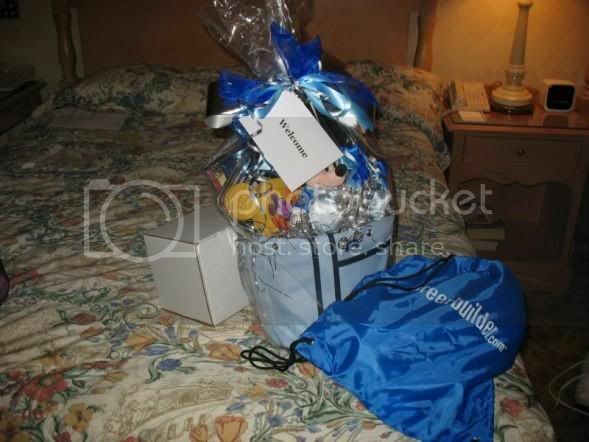 When we returned to the hotel, our gift basket had arrived with an assortment of goodies in it. From Careerbuilder we received a blanket, hat, some mints and my favorite the tiny chapstick. 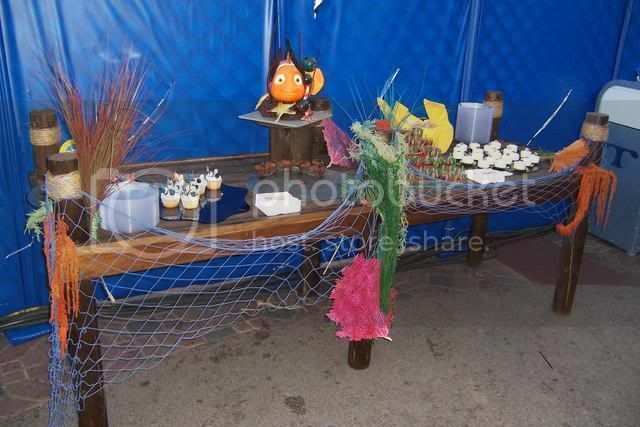 From Disney we had a Finding Nemo Press Event Sub Invitation and a gift basket. 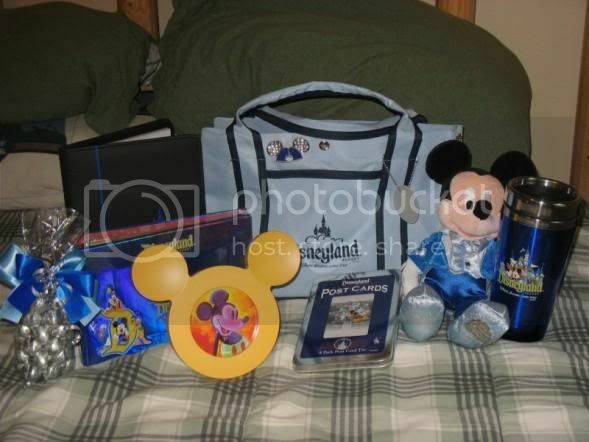 The basket contained photo frame, photo keepsake book, a YOMD Mickey plush, some postcards, a YOMD Mickey ear pin, some chocolates, a mug and a tote bag. 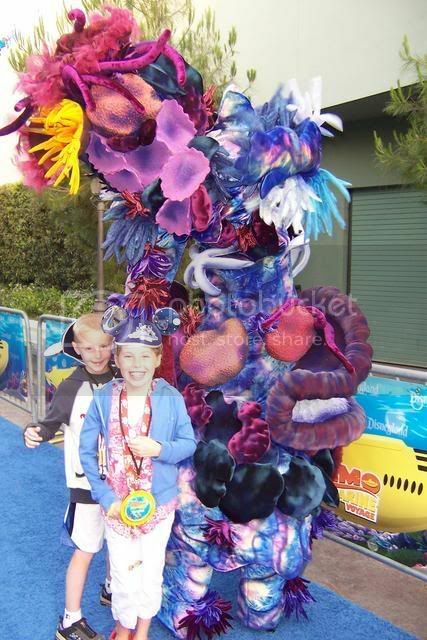 We were also given park hopper tickets and invitations to the Finding Nemo Event. The day started with another 6:30 meet up to go to Makeup and Costuming again. 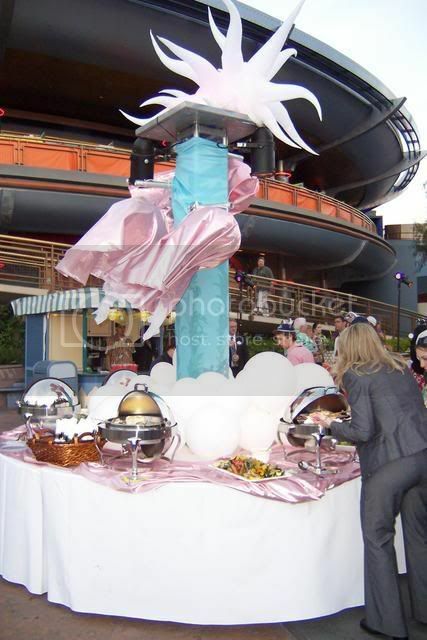 After that we were paraded over to Tomorrowland to prepare for the quick appearance at the Sub Launch. We were told that we were just to parade by and wave. They at the last moment the guy said to wave as your character would. I pulled the pirates aside, and since we are last in line, we decided to stop for a moment and take a quick bow with a tip of the hat. It was fun to steal the stage again. We are pirates right??? We had quick makeup touch ups and then off we go to the Island. We tried to make a few magical moments and take some photos and autographs on the way to the Island. We arrived at the Cast Member raft in Critter Country and are taken over to Pirates Lair TSI. 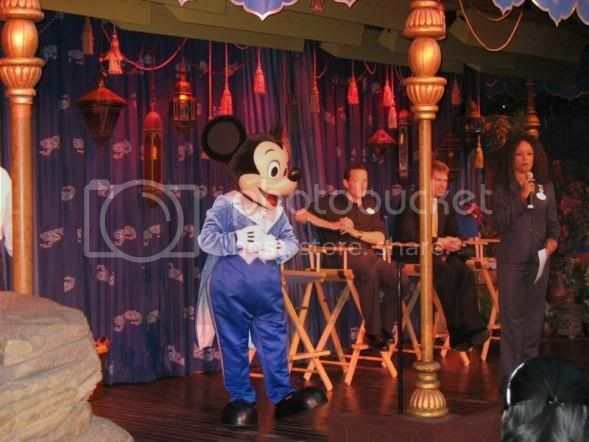 We are taken backstage to the Cast Member tent and meet the other characters in costume. A LOT of waiting took place here. We took advantage of the time and took some photos in the tent. 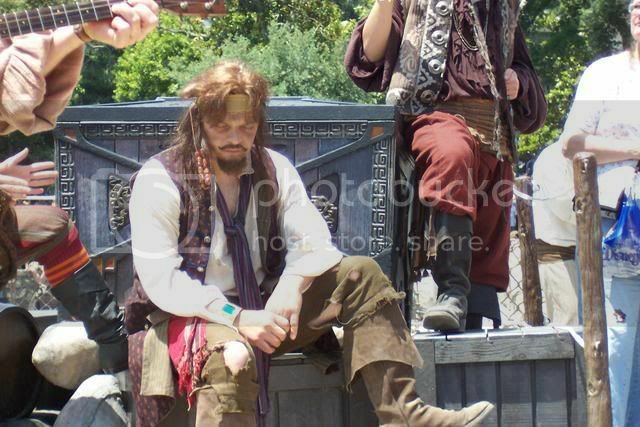 The pirates had pillaged some of the decor from the recent POTC opening and it made a nice backdrop for photos with Stunt Show Jack Sparrow. At this time, we learn the Disney philosophy when it comes to shows, Hurry up and wait. We hurried to get there only to wait quite a while. We finally arrive for the stage show and it was great fun singing along to the sea chanties and getting to do some pantomime to the songs. They introduce each of our characters and we get to explain our backstory and curse. After the show we are given time to play with the guests. 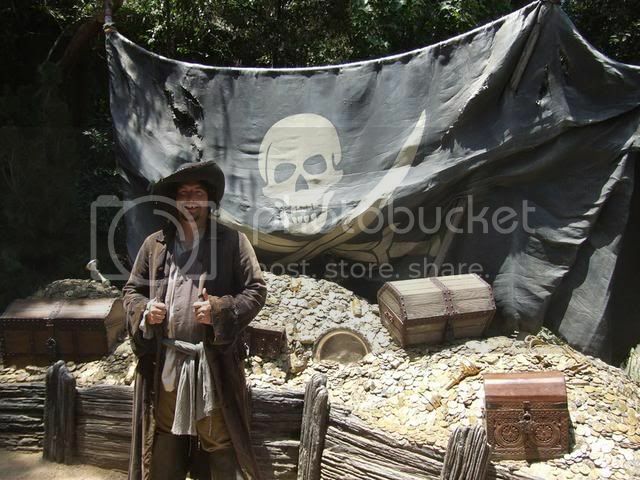 I remember the CM on the cast raft saying, Its about time there are pirates on the Island to actually play with the kids. I thought this was a regular thing. Glenn explained that we get to be the test subjects. We played at the bone cage, the pumper station, the treasure lift and the pontoon bridge. We got to pull lots of pranks and jokes. We would see people in sunglasses and ask how they can see with the double eyepatches. I would ask someone if they would like to have a photo only to steal their camera and: take a photo of them, turn the camera on myself or take pictures of other guests. I had asked Glenn if I could use Tooth Black Out since my character must smile and he said sure, so I blacked out a couple of teeth. I would talk to the kids about the new invention they rub on their teeth, they would say, a toothbrush! I would tell them to use it or theyd look like me and smile real big. We would try to steal peoples gold like chains or bracelets. I remember chasing a little boy through NOS trying to get his treasure bag. Wed ask the kids to help us find the treasure. Many were so sweet they would even offer to give us a pin or their treasure map. (I thought later how great it would have been to have simple stickers that say something about Pirates Lair to give the kids for helping.) I would steal peoples drinks off their table and when I’d spot a young lady with a young man, I’d steal her away. 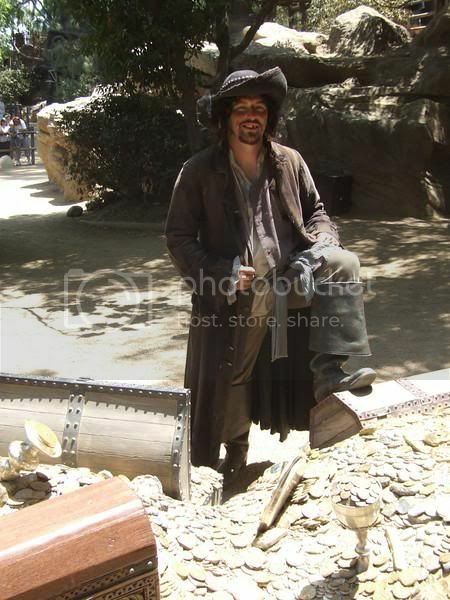 Its amazing what you can do when you are dressed like a pirate. THIS WAS THE WHOLE REASON I ENTERED, TO SPEND TIME WITH THE GUESTS, ESPECIALLY THE CHILDREN. I found my kids while wandering the Island and stopped for a photo. We had to do some more photos and video wrap ups. Youll notice the ending with the pirate flag here. They couldnt get the lighting just right. This is where I got to meet Darkbeer and spoke to him briefly out of character as we were off stage. He took some terrific photos that I appreciate greatly. We were then ushered off the Island and back through NOS and Frontierland. It hit me when a child asked for an autograph that we are probably the most limited characters that Disney has ever produced. 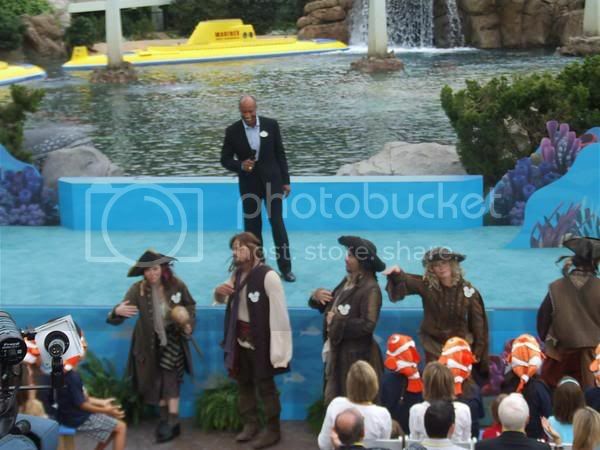 I could just see a person in 10 years flipping through their books and saying, “Oh, I remember that whacky pirate.” The tour guides were trying to help us get offstage, but I was in no hurry. I would take a few steps and stop for an autograph or photo or play a prank and do it all over again. I was the hardest to get offstage. They wanted to get us to a very late lunch, but I cared more about one more magical moment. My last guest to sign for was a little girl. Her mother handed me her book and said, You’re the first autograph shes ever gotten. This is her first trip to Disneyland. After I stepped away I cried, it was so special. I’m sure it was a Magical Moment for the little girl and her family, but it wouldn’t compare to how it felt to me. If I had hurried I would have missed that moment. We got out of makeup and costuming and had lunch again at the Eat Ticket and during the lunch the camera crew came in and told us they were missing a shot to provide to the press and asked if we would re-dress for another shot. 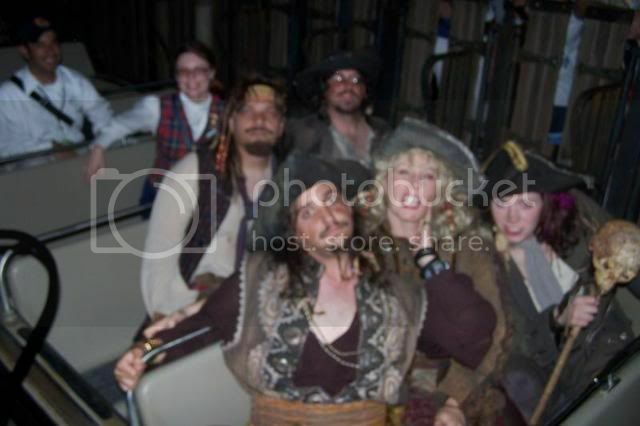 I told them I would, if they would let me get a photo made in the jail on POTC. They said they couldn’t do that, but Marc said hed try to get us an exclusive ride in our own boat. 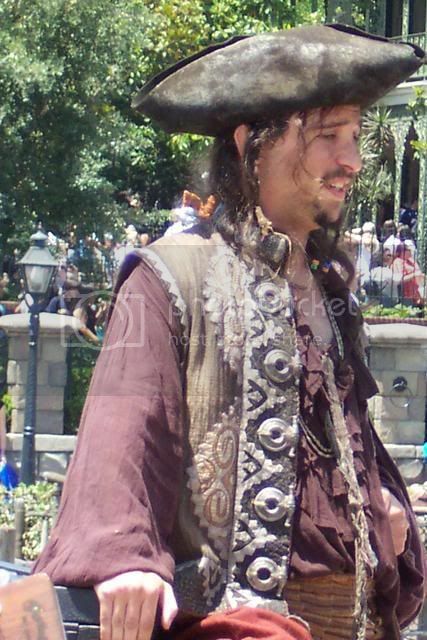 He made it happen and the pirates commandeered POTC. 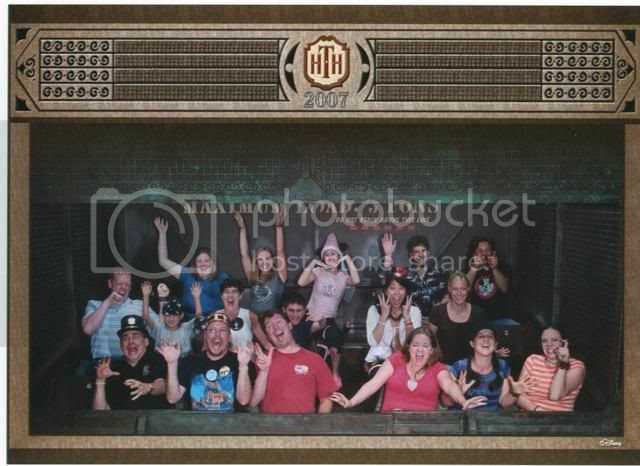 They took some photos of us on the ride. My favorite is the one with the auction behind us. 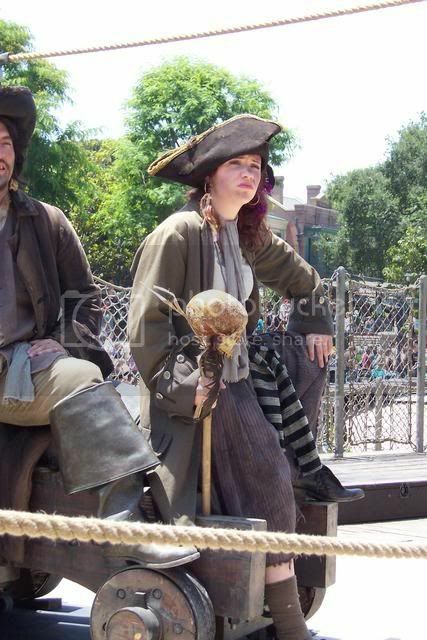 We barely missed the redhead, but got the larboard side, which fit for our part of the show. Upon leaving, we went over to the Disney gallery for some more photos. I got to include my children and my friend Rob Z too. I stopped for another photo with my family. It was great fun. We were stopped by a lady who wanted a photo, but had no camera. Too funny! I took my time going offstage and had some more fun with guests. When we got to the yellow line that you cross upon going back stage, Stephane (Laverne) and I resisted going as our curse would be broken and wed no longer be pirates. A very sad walk back for me. I wish I lived closer to Disney so I could do this at least once a month just for free. Marc and Milissa, our guides gave us a gift bag with some buttons and maps from each of the Pirates premieres, a pirate arm band, sweat band and key chain and a very thoughtful note. After a quick shower and change we went to our final reception. Upon entering there were some light snacks and desserts and drinks. Our kids got to meet our Ushers for Traditions. My son was excited to see Pirate Goofy for the first time and my daughters loved Cheerleader Daisy and Princess Minnie. Our ambassador Adonis asked if anyone wanted share about their experience. With no shy bones about me I shared about how touching it was to see the look in the kids eyes only to have Year of a Millino Dreams Mickey appear and give me a hug. 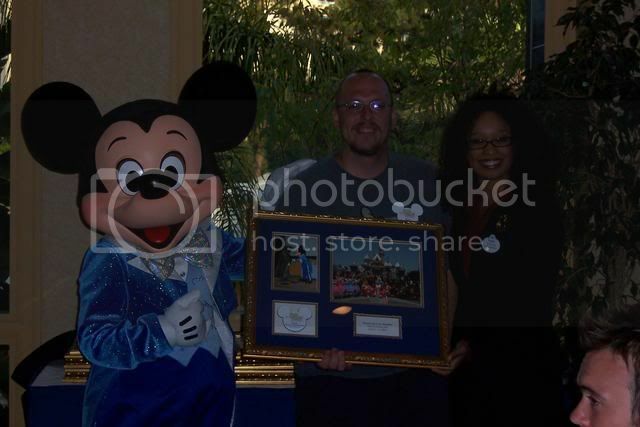 They gave us a final gift of a huge framed group photo, solo photo with Mickey, copy of our Honorary name badge and card commemorating the event. When they called my name I heard a huge cheer, it was very moving. My kids got all the other winners autographs to add to their books and we shared stories of the day. I remember one JC Skipper tell me of a newlywed couple on their first cruise. She said they came back later looking for her to ride again. 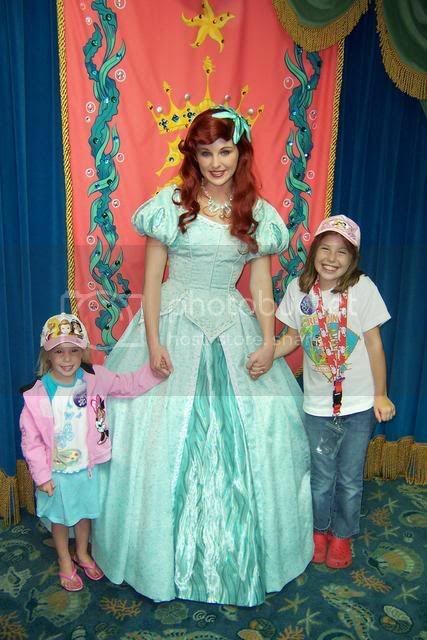 Princesses told of little girls who wanted to meet a Princess of the same name. Butlers actually enjoyed the dog walking because they could interact with the children. Their favorite part, of course, was the exclusive walk through. Paraders loved the looks in the kids eyes and getting to play basketball with them. The pirates rocked the house though. 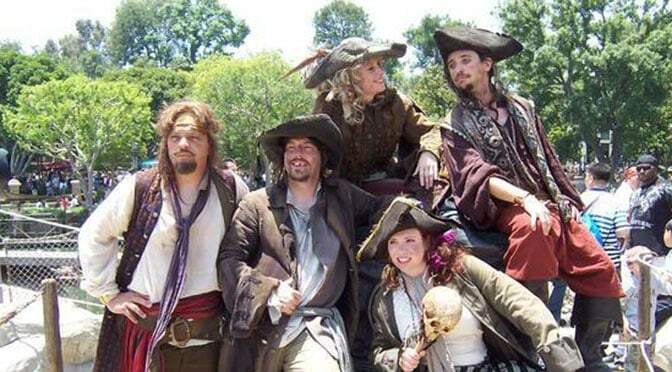 I can understand what Johnny Depp meant when he said Pirates were the rockstars of their day. Everywhere we would go you’d hear, There’s a pirate! Kids, girls, and grown women would get excited to meet you in character. The next day I was just a regular guy and no one knew or cared who I was, strange to say the least. 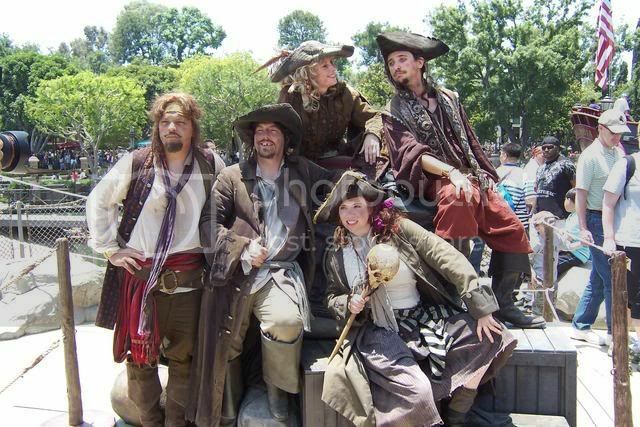 The crew I pillaged with was amazing. Brynne (Capt. Dante) wants to be an actress. Her dream is to play Belle on Broadway. I told her not forget us little people. Stephanie (Laverne Enchante) is a drama director at her church and has the quick wit of a stand up comedian. She was so much fun to be around. Billy (Billy Books) is such a kind and thoughtful man who truly loves children and he gets to show them that if they can dream it they can do it. I loved how he included reading into his character as he used to teach Kindergarten and 1st grade before becoming a principal. Al (Johnny Crimson) is such a nice guy. He is always smiling and very intelligent. He dreams of being a pirate and hopes this might turn into a real gig. 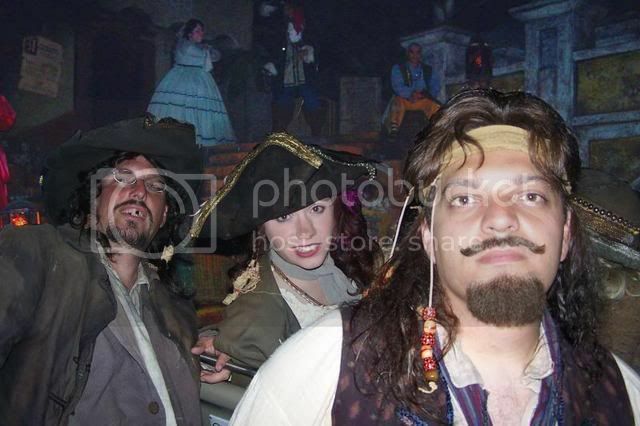 No one knew what Al was like offstage except us Pirates, he liked being the Jack Sparrow wannabe. Thanks again to all the Disney CMs who made this possible. It was a dream come true! I love your sincerity and passion for fun. You are a blessed man, and your family is lucky to have such a great role-model. Love reading your story! Thanks for all the hard work you do to help others have amazing experiences as well! It almost brought tears to my eyes!! Kenny, I have followed you for a long time and marveled at your knowledge and enthusiasm…its contagious!! I loved your story, and the photos. Today was my first time reading it. You always amaze me and I know Disney is in your heart…it shows with every post you make. Thanks for helping so many of us plan our trips, and enjoy the parks thru you when we can’t be there! Congratulations on winning a once in a lifetime contest! It looks like it was an amazing experience! 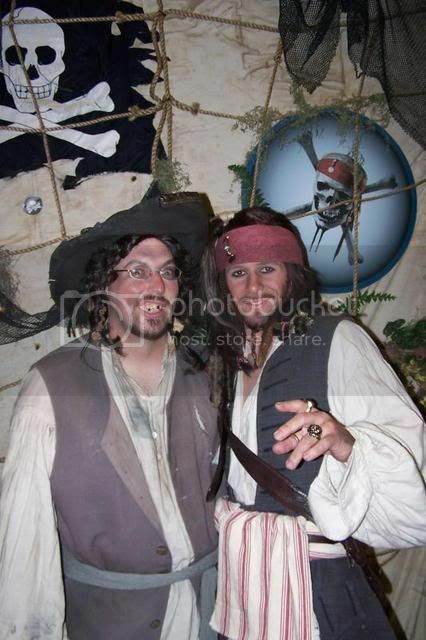 Kenny, I stumbled across your site and was grateful for all the invaluable information you’ve painstakingly gathered together; then I read your story, watched the videos, and understood how you and the KennythePirate site came to be. It isn’t always the case that good people have good things happen to them, but your energy, enthusiasm and talent are apparent, and being chosen for the Dream Job of Pirate was a well-deserved honor. I enjoyed getting to know you and your family — and the delight on your children’s faces made me smile. What a terrific father you are, and a wonderful individual who puts his belief in the power of connection and community into practice. Thank you for creating such a terrific site and for sharing your tale. Awesome story – loved reading about your experience!!!! This was amazing!!!! So lucky to have that experience and be able to involve your family!!! Nice job Pirate! Talk about living the dream! And what a wonderful pirate you arrrrrrgh! I’m so glad I stumbled across this today! Thank you for sharing your experiences! 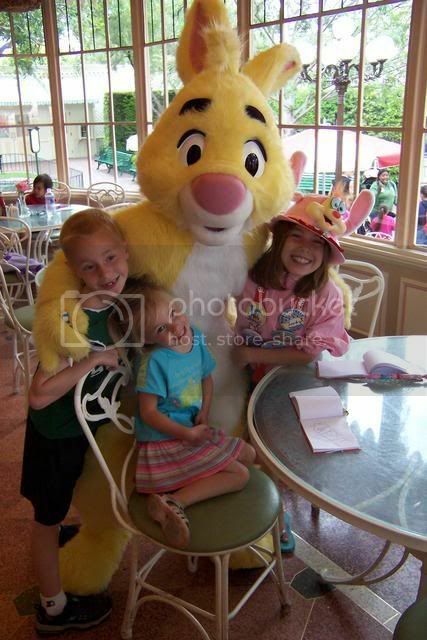 I recently listened to your interview on the WDW Prep School podcast, in which you recounted a bit of this experience, including the part about that last autograph for the little girl whose first visit it was, and how much of an impact it had on you that day, and then so much more. After reading about it here, it made me wonder about that little girl, and if she has any idea about how much she influenced you! Probably no clue, but it was a great experience! I never knew everything that opportunity entailed. Great being able to read the story! Sure brings back some great memories! It was a magical experience and I couldn’t think of a better group to do it with. Yes, my friend, those were some good times, but it’s great that we’ve shared even more since.